The Conference is being organized by Tragsa Group, with the Spanish Geological Survey (IGME) and the International Water Resources Association as invited co-organizers. Hydroinformatics is a branch of informatics which concentrates on the application of information and communications technologies (ICTs) in addressing the increasingly serious problems of the equitable and efficient use of water for many different purposes. HIC 2018 seeks to create a forum for exchanging ideas, for promoting ground-breaking technologies, for proposing new extensive collaborations, for finding new solutions for water management and environment preservation. The objectives of the Cargèse summer school are to provide participants with a high level interdisciplinary training on the fundamental processes and recent theoretical and methodological advances that have emerged in the study of flow, transport and biogeochemical processes in the subsurface. 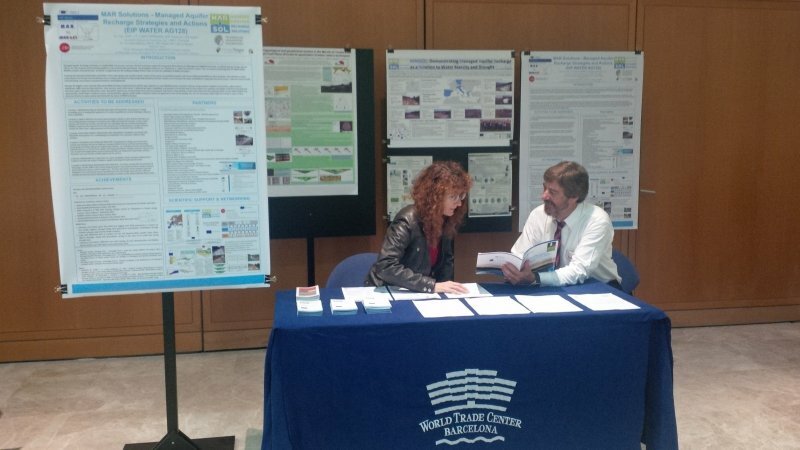 The main objectives of the 2018 Water JPI Conference are to (i) showcase the results of the research achieved through Water JPI activities and especially address their impact under selected themes, mainly "Emerging pollutants", (ii) raise awareness of Water JPI and its impact, and (iii) enhance dialog between researchers, stakeholders and policy makers. Terrestrial water resources are coupled hydrosystems with compartments reaching from the atmosphere to aquifers. Their sustainable management requires predictive models simulating all relevant hydrological and (biogeo)chemical processes. The related processes are uncertain; they are affected by heterogeneity, and undergo change. The Research Training Group “Integrated Hydrosystem Modelling” of the Universities of Tübingen, Hohenheim, and Stuttgart targets multi-disciplinary, cross-compartimental modelling of flow and reactive transport under uncertainty. Market & Investment for Innovative Digital Solutions - Water Market Europe is the new event cycle that WssTP has set up to create a unique innovation and business environment, where state of the art water knowledge and research results can meet with market actors within and outside the water sector to create value and new business opportunities. Recharge to the Rescue!, Managed Aquifer Recharge as a Water Management Tool. This event continues a long-standing series of symposia originating in Arizona in 1978. BSMAR 16 will feature numerous oral presentations, poster presentations, an awards luncheon as well as optional workshops and an optional field trip the day prior to the symposium. In the context of Porto Water Innovation Week 2017 and the EIP Water Conference, on 29 September 2017, MARSOL will be part of a special public event on "Boosting Innovation in the Water Sector: The Impact of EU-funded actions". The event will bring together water-related EU-funded actions with the objective to maximise the impact of water research and innovation actions. Participants of different EU programmes and initiatives will share their achievements and experiences, discuss the key enabling factors and barriers for innovations to reach the market and see how research and innovation actions can effectively support policy making. The EIP Water AG 128 MARtoMARket side event on "MARsolutions, TWIs and modelling" is to discuss and disseminate to Actors and SMEs the achievements of FP7 MARSOL and the H2020 PIANO (http://project-piano.net/), FREEWAT (http://www.freewat.eu/) and AquaNES (http://www.aquanes.eu/) projects. In this side event we intend to discuss the next steps, including the legal ones, to further bring those EU MAR achievements and TWIs to the market, via Actors and SMEs, not only in Europe and China but also to disseminate them worldwide, for climate variability preparedness, aiming at a scientifically based drought mitigation and flood control. 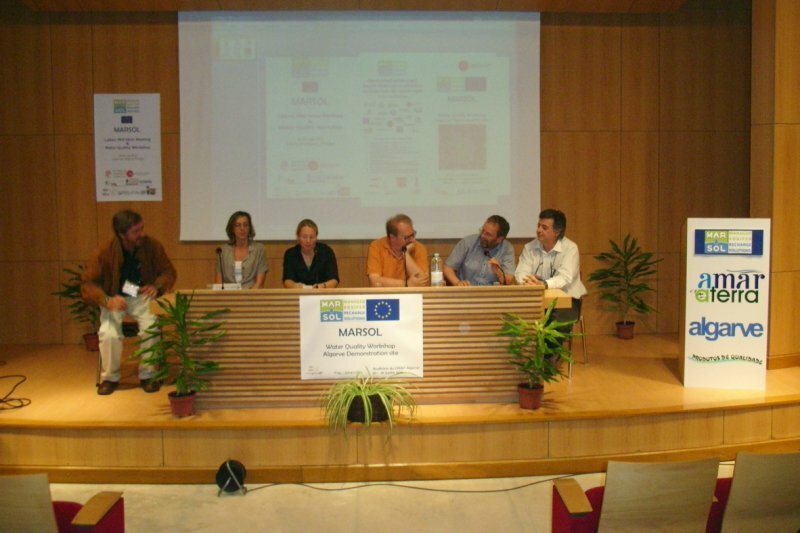 LNEC, UALG and TARH, with the pro-active participation of Algarve stakeholders Agência Portuguesa do Âmbiente, Águas do Algarve, S.A., and Direção Regional de Agricultura e Pescas do Algarve, have been organizing a final MARSOL Workshop in Faro, Algarve, Portugal, to present the results of the project and particularly of the Portuguese demonstration sites. We acknowledge workshop dissemination support from the Associação Portuguesa dos Recursos Hídricos (APRH), Parceria Portuguesa para a Água (PPA), and the International Association of Hydrogeologists (IAH/AIH). A summary and the presentations given will be available via the EIP Water Action Group 128 "MARtoMARket - Managed Aquifer Recharge Strategies and Actions". The goal of the workshop (organized within the EU FP7 MARSOL project and the EIP Action Group 128 by Provincia di Lucca and Scuola Superiore Sant’Anna) was to discuss, two years after a previous conference on mAR in Italy held in GEOFLUID - Piacenza, the state-of-art of the application of Managed Aquifer Recharge techniques in Italy in light of the recent Decree 100/2016 of the Ministry of Environment (Regulation containing criteria for granting authorization to recharge or to increasing artificially groundwater bodies). Based on the activities carried out as part of projects co-financed by the European Union (MARSOL, WADIS-MAR, AQUOR, WARBO, etc.) and pilot projects at national scale, technical and environmental and regulatory aspects and market potentials of this technique were discussed. Aspects related to natural water retention measures, passive treatment systems and methodologies for the design and management of such systems were presented. After discussing the presentations of the two sessions, a panel of experts drafted conclusions and implications on using MAR in Italy. The event was held in Italian language. The MARSOL project is pleased to announce an international Advanced Study Course (ASC) on Managed Aquifer Recharge with a focus on specific water quality issues (such as organic micropollutants) and reactive modeling techniques. The lecturers of the course are experts from different MARSOL project partners and members of the project's External Advisory Panel. The ASC was intended for graduate and post-graduate students, PhD students, and postdocs in the fields of geoscien­ces, water research, environmental research, or related areas; it was also directed at professionals aiming at im­proving or broadening their qualification. A certificate of participation was issued at the end of the course. Participation in the course was free of charge. In total, 24 participants from 13 different countries (Afghanistan, Bangladesh, China, Columbia, Germany, Greece, India, Israel, Italy, Nicaragua, Peru, Spain, and USA) attended the course. The internal final meeting of the MARSOL project took place in Leipzig, Germany, on 17. to 19. of October, 2016, on the premises of UFZ. The participants of this summer school will learn about different MAR techniques and will be guided through different steps in planing, operation and optimization of MAR schemes. This workshop on financial and economic aspects of MAR operations took place on 6. June 2016, the day before the start of the international conference on Citizen Observatories for Water Management on 7. - 9. June in Venice. The workshop featured presentations and discussions around MAR-related topics such as economical and financial issues and possible market potentials. 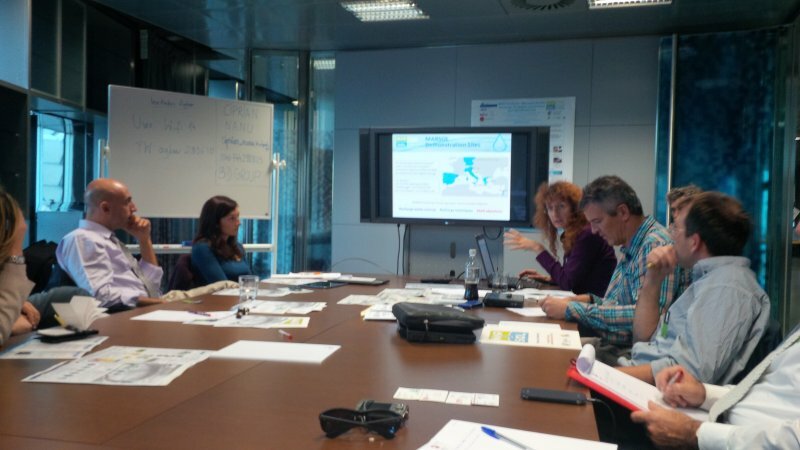 The Rio Brenta demonstration site was visited by the participants, and the monitoring system, modeling activities, and respective results was presented. The workshop featured in-door sessions as well as participation in active field work and site visits. The event has had 21 presentations of the project partners who lead the eight demo sites involved, as well as external experts and various Greek and German agents related to the branches of metallurgy, hydrogeology, geophysics, ICT, instrumentation, etc. The workshop included expositions of the efficiency of various monitoring technologies such as direct push, wireless sensors, time and frequency domain technologies, management parameters based on ICT, smart sensors, etc. MARSOL partner UFZ also brought from Germany a full investigation and drilling truck with different systems and equipments. The third EIP Water Conference of the European Innovation Partnership on Water was held on 10. February 2016 in Leeuwarden, The Netherlands, under the headline "How is water innovation succeeding in Europe". An open side meeting by the EIP Water AG 128 MARtoMARket and the MARSOL project on "Boosting Managed Aquifer Recharge in Europe" took place on Tue. February 9, 2016. It aimed at presenting and discussing the best way for training researchers, industry/SMEs, and end users on Managed Aquifer Recharge (MAR) and new developments in this field, to foster knowledge in Europe and in the Mediterranean area specially among MAR project partners and to ensure that MAR project's RTD and DEMO results effectively reaches the end-users. About 20 participants registered for the meeting. The meeting included 10 presentations from 7 member states, sponsored by several FP7, H2020 and national MAR projects. 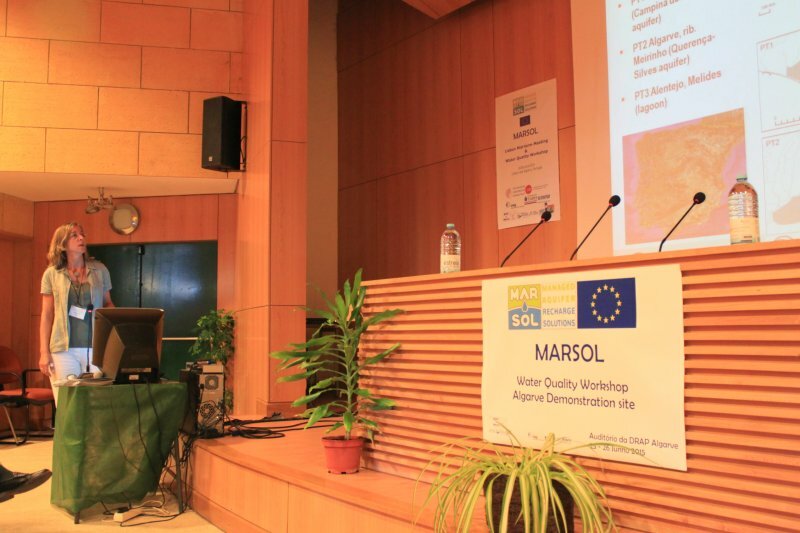 The presentations highlighted that during 2015 six out of eight FP7 MARSOL project demonstration sites were either newly developed or upgraded. As main conclusion MARtoMArket AG members stressed the relevancy of MAR technologies as part of the solution towards a better adaptation to climate change, reinforcing the green circular economy not only in Europe, but also in the Mediterranean area and worldwide. Participants also highlighted the relevancy of working together with other thematic complementary EIP Water AGs suggesting that the EIP organizes a meeting with AGs team leaders during the first semester of 2016, in Brussels. The MARSOL Workshop on "Legal Issues, Policy and Governance of MAR Activities" was held in October 2015 in Malta. The application of MAR is highly dependent on a legal framework that supports its application on an EU wide scale. The Water Framework Directive (2000/60/EC) considers artificial recharge as one of the management tools which can be utilised by Member States for the achievement of good groundwater status. The provisions of this Directive are aimed at ensuring that the necessary controls are in place to eliminate the possibility of any degradation in the qualitative status of the receiving body of groundwater. In the same spirit the Groundwater Directive (2006) establishes specific measures for the assessment of good groundwater chemical status and complements the provisions preventing or limiting inputs of pollutants into groundwater (already contained in Directive 2000/60/EC), and aims to prevent the deterioration of the status of all groundwater bodies. A draft regulatory framework was presented and its applicability discussed using the MARSOL demonstration sites as case studies. The workshop was also attended by local stakeholders, namely from Maltese water authorities and ministries. 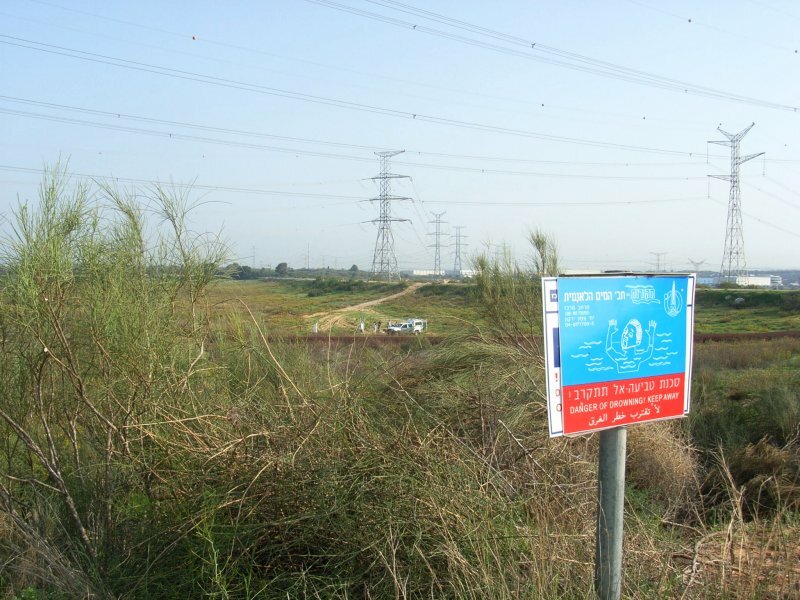 Accompanying field trips included visits to the Ta' Kandja Groundwater Pumping Station, the MARSOL demo site on the premises of the Ta' Barkat WWTP, and the Pembroke Desalination Plant. Manuel Sapiano from the Maltese Water Unit kicking off the discussions. 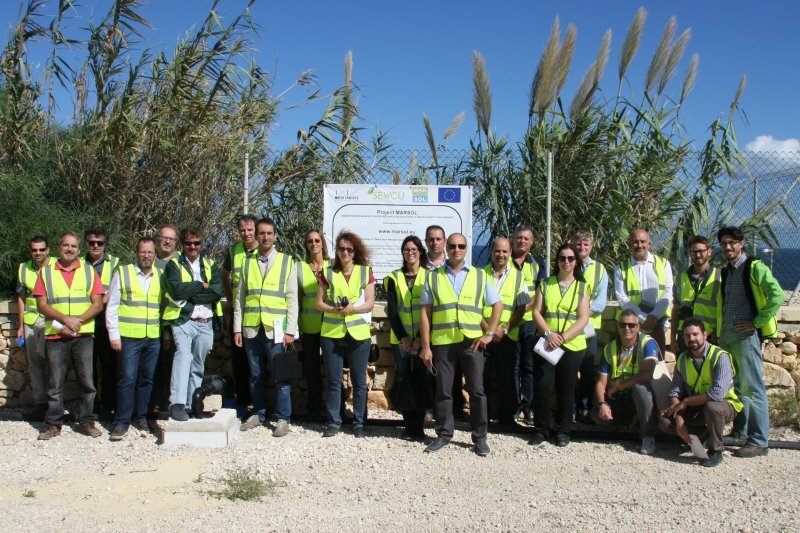 The MARSOL group visiting the South Malta demo site on the premises of the Ta' Barkat WWTP. The MARSOL Workshop on "Water Quality Aspects of Managed Aquifer Recharge" was successfully held after the project's mid-term meeting in June 2015. The overall objective of the Workshop was to collect research results, practical experience, and innovative ideas related to water quality issues in MAR activities, and through this to contribute to the training of project participants' staff and researchers as well as other stakeholders in the water sector such as industry/SMEs, authorities, and end users. The workshop topic of "Water Quality" addressed changes and associated risks in the chemical status and hydraulic properties of water bodies due to infiltration of various water sources in MAR installations. 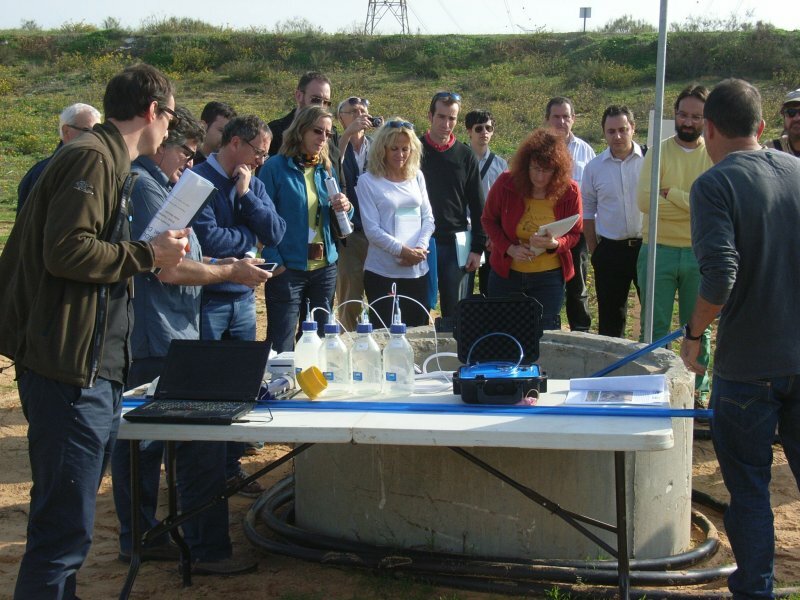 The workshop was organized in four sessions introducing the background, a specific Portuguese Demo Site session, another one addressed to all 8 MARSOL Demo Sites as well as a scientific session on Water Quality. 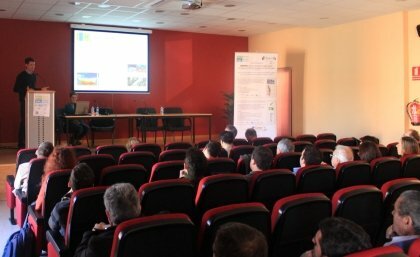 Several Managed Aquifer Recharge (MAR) techniques, such as Soil-Aquifer Treatment (SAT) were addressed, as they are expected to be applied to Algarve aquifers. One major aim is to regain the good water quality status envisaged by the Water Framework Directive and the Portuguese Water Law in a near future. Workshop announcement on the EIP Water "Online Market Place"
T. Leitao (LNEC) presenting the Portugese MARSOL demonstration sites of the Algarve and Alentejo regions. 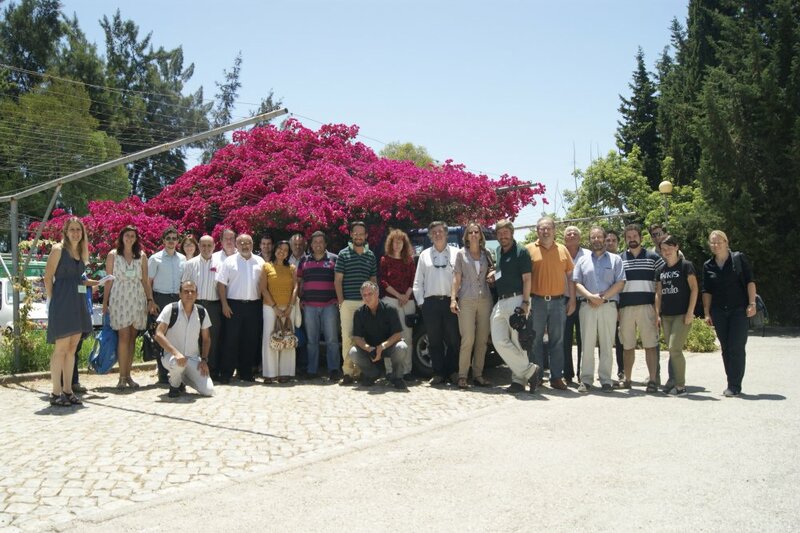 The MARSOL internal mid-term meeting took place in Lisbon, Portugal, on 22. and 23. of June, 2015, on the premises of LNEC. All partners of the MARSOL project presented the status and first results of their work, according to the work plan and work package structure. The presentations at the meeting represented the status of the project at mid-term (months 1-18). During this first half of the project, six out of eight demonstration sites were either newly developed or upgraded. Operations of the field sites were accompanied by an extensive investigation and monitoring program using geoprobe campaigns, geophysical methods, and tracer techniques. Specifically, sensors for unsaturated zone water content monitoring and wireless data transmission systems have been developed in the first year of the project and are already implemented and tested in a field site in Italy. With this, the field sites are generating high quality data on infiltrated water volumes as well as on water quality changes during infiltration. Specifically water quality aspects have been targeted as this is the most crucial point for successful implementation and public acceptance. First a literature review on potential compounds in various water sources used for MAR systems has been performed for countries of the Mediterranean basin. Water sources considered were surface water from rivers, streams or lakes, reclaimed water that comprises treated municipal (and to a certain extent industrial) wastewater, rain and storm water, and (less commonly) other sources such as desalinated seawater. Overall, 84 organic micropollutants were identified including 52 human pharmaceuticals, 24 industrial chemicals, 5 food additives and 3 pesticides. The number of positive findings of micropollutants is generally higher in surface water influenced by urban discharge. Then micropollutants have been analysed in several of the MARSOL demo sites. Highest numbers and total concentrations of micropollutants were found in an urban run-off channel at the Alcazarén (Spain) and Serchio River (Italy) demo sites. The number of positive findings of micropollutants in treated wastewater ranged between 24 and 34 at the Messines (Portugal) demo site and South Malta, respectively. MARSOL is therefore generating comprehensive data sets on water quality aspects at MAR in general and of operating MAR sites. These data are the basis for optimizing operational regimes e.g. in accompanying laboratory column experiments for the sites in Israel and Greece, or by incorporating reactive layers at selected infiltration basins, e.g. at the Llobregat river in Spain. For all field sites, experimental work is accompanied by modelling efforts to understand the hydraulic characteristics and the geochemical conditions at the site, as well as the impact of the MAR systems within the selected catchments. Models range from small scale, reactive transport models, e.g. for the Llobregat river demo site in Spain, to 3D finite element flow and transport models, e.g. for the Campina de Faro aquifer in Portugal. For the Lavrion site in Greece and the Menashe site in Israel, catchment scale numerical flow models were developed. Models will be constantly updated with data that will be generated in the course of the project. To maximize impact, the demonstration sites have been used for dissemination and training activities. 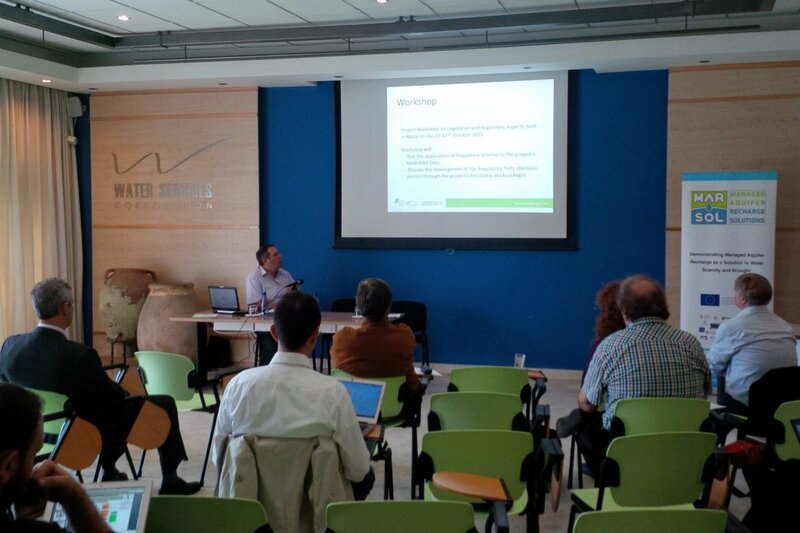 In total five workshops were organized in Spain ("Managed Aquifer Recharge in the Arenales Areas - MAR4FARM", October 2014); Israel (“MAR-SAT Expert Forum Workshop”, December 2014); Spain (“Technical Solutions for Managed Aquifer Recharge - MARenales", March 2015); Portugal ("Water Quality Aspects of Managed Aquifer Recharge", April 2015), and Italy (“Advantages of using Numerical Modelling in Water Resources Management and Managed Aquifer Recharge Schemes", April 2015). 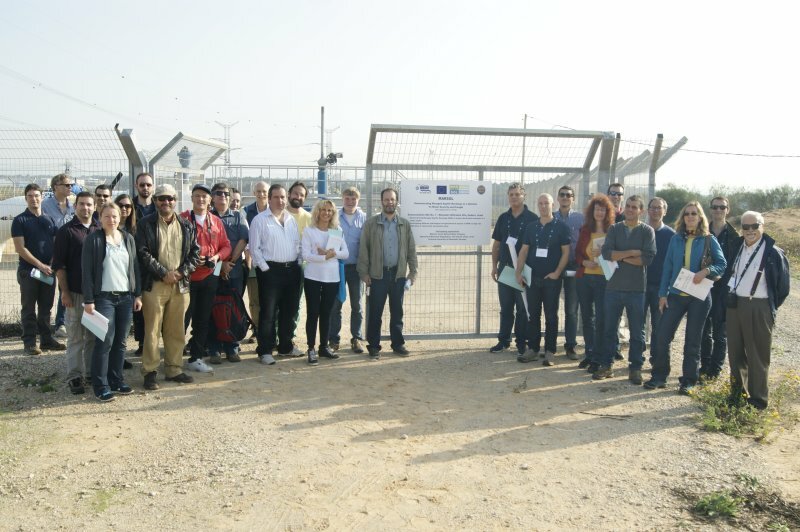 The workshops in Israel and Italy were organized in cooperation with the FP7 project DEMOWARE and the Horizon 2020 project FREEWAT, respectively, to identify synergies and establish contacts between the project partners. In addition, the EIP Water Action Group AG128 "MAR Solutions - Managed Aquifer Recharge Strategies and Actions" is used as a forum to promote the MARSOL approaches on an international level. The mid-term meeting was followed by a one-day field trip to the project's demonstration sites in Southern Portugal, namely in the Alentejo and Algarve regions. 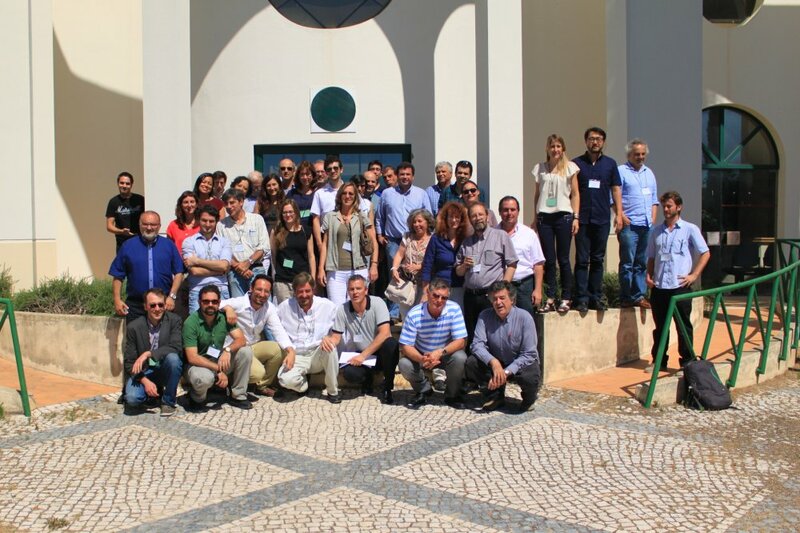 Participants of the "Water Quality" Workshop, to be held in Faro immediately after the mid-term meeting (s. above on this page), already took part in the field visits. The main goal of this workshop was to showcase the use of modelling tools to manage water resources. Aside from presentations on recent research advancements, the focus was given to real case applications of modelling tools used to plan and manage the use of water resources, especially groundwater. Particular attention was given to demonstrate the use of these tools in Managed Aquifer Recharge issues. 21.04.2015: Workshop "Advantages of using Numerical Modeling in Water Resources Management and Managed Aquifer Recharge Schemes". 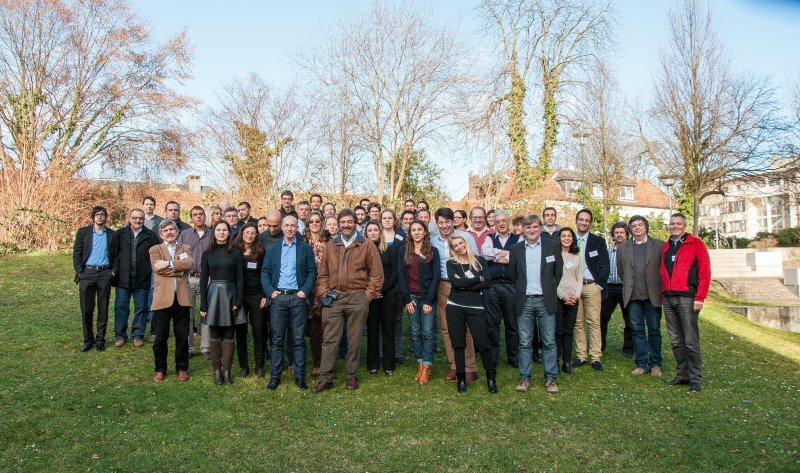 An international workshop on numerical modelling of hydrological processes and groundwater flow and solute transport in aquifers, held in synergy with the new EU HORIZON 2020 project FREEWAT ("Free and Open Source Software for Water Resource Management"). About 130 persons attended the free workshop, both from the academy and the professional world. 22.04.2015: Indoor session on modelling in MAR, focusing on MARSOL partners presentations, followed by a field trip to the Sant’Alessio demo site and the San Niccolò phyto-treatment experimental site. 23.04.2015: Internal working group meetings. Updated workshop program flyer "Advantages of using Numerical Modeling in Water Resources Management and Managed Aquifer Recharge Schemes"
To expose the technical solutions applied by the partner’s expertise regarding each demo-site, studying the applicability to be used in other equivalent environments. Exposition of successful water management criteria, mentioning the "must" as well as the "musn't". Criteria for cleaning and maintenance of the existing structures lengthening the infiltration capacity and the life-span of the structures. Other criteria that the expert speakers could include in their presentations regarding technical solutions, benchmarking, indicators and dissemination procedures. Response to all the questions that could arise along the full workshop. The workshop has had two sessions, one project-internal session and one open session involving farmers from the irrigation community and other end-users. Sessions were held in Coca Castle (Segovia), and Gomezserracín (Valladolid). The field trip, apart from visiting MAR facilities, included visits to agro-industries related to MAR, such as a vegetables packaging and exportation factory. There have been in total 50 participants from seven European countries, plus Korea and Israel, including technicians from the regional river basin authorities and from the regional government as well as invited guests from other, thematically related European projects. The organizers of the workshop have received written congrats from participants, outlining the good example of technical solutions deployment from the theoretical background, the excellent participation of farmers in the water management schemes and relation to MAR activities, and the excellent framework between researchers and end-users. 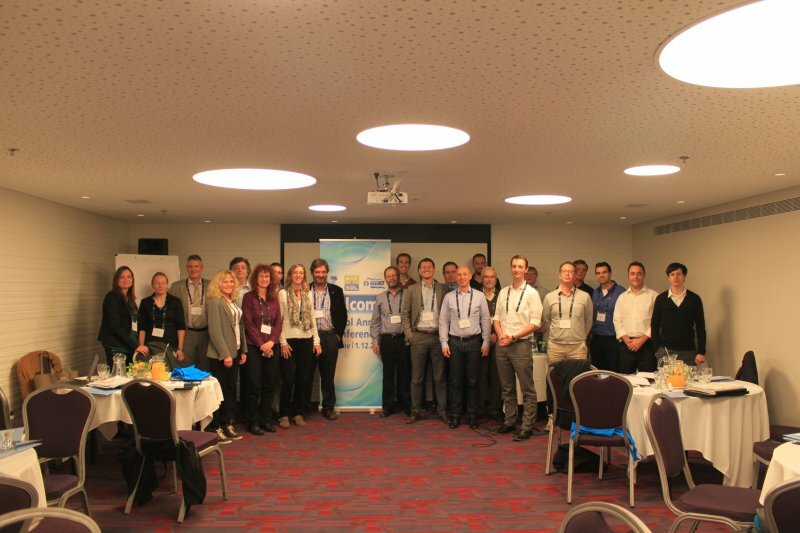 A MARSOL core group meeting was held on November 30th to December 2nd in Tel Aviv, Israel. The meeting involved presentations on the progress of the various work packages, a Steering Group meeting, and a visit of the Menashe demonstration site near the city of Hadera. 26 participants from 15 project partner institutions attended the progress meeting. The group was honoured to welcome Dr. Peter Dillon, member of the MARSOL advisory panel and chairman of the IAH Commission on Managing Aquifer Recharge, as special guest to the meeting. The MARSOL project meeting was followed by a two-days joint workshop of the MARSOL and DEMOWARE EU projects featuring a MAR-SAT Expert Forum Workshop at the ISERD headquarter (December 3rd to 4th). The minutes of the workshop and its presentations programme can be downloaded here. The second EIP Water annual Conference took place on November 5th in Barcelona. Several MARSOL partners (from TUDa, LNEC, Tragsa, UPC, SGI, AAWA, and Paragon) attended the conference and participated in special Action Groups 'back-to-back' meetings. In an open workshop of Action Group AG128 MAR Solutions - Managed Aquifer Recharge Strategies and Actions the status of the MARSOL project was presented alongside presentations from other project groups. Since 2002, when MAR activities began in this sector of the Arenales aquifer, considered a building work for the general interest of the nation, recharge activities have been accomplished by means of the irrigation community, counting on the support, when required, from those technicians involved in the studies and building works. After a decade, many groundwater users and farmers ignore a great part of this activity. 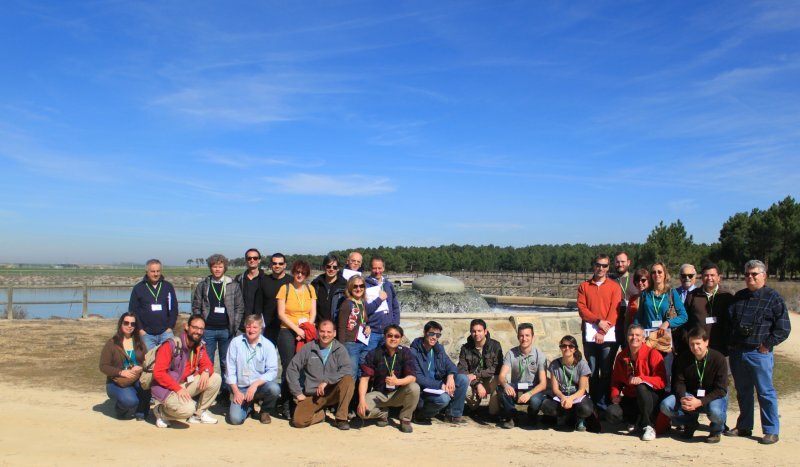 Within the R&D MARSOL project context, and with the help provided by Santiuste and Carracillo irrigation communities, two consecutive workshops, called MAR4FARM, have been organized by Tragsa, exposing these experiences in the main Arenales aquifer MAR areas, exposing a SAT-MAR experience too. Information on the workshop in both Spanish and English can be found here, including all presentations for download. 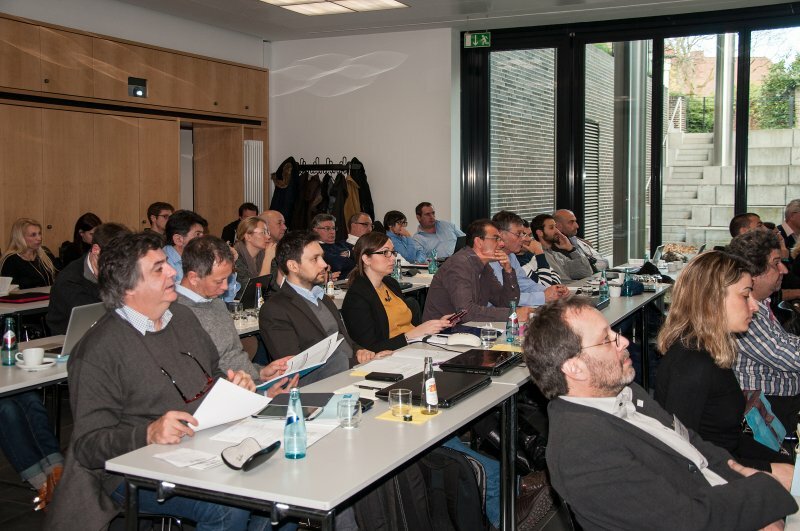 The MARSOL kick-off meeting was held in January 16th to 17th 2014 at TU Darmstadt, Germany, to launch the project. 48 participants from the project's partner institutions took part in the discussions.